Aruba is a 32 km long island of the Lesser Antilles in the Caribbean Sea, 27 km north of the Paraguaná Peninsula, Falcón State, Venezuela, and it forms a part of the Kingdom of the Netherlands. Unlike much of the Caribbean region, it has a dry climate and an arid, cactus-strewn landscape. This climate has helped tourism as visitors to the island can reliably expect warm, sunny weather. It has a land area of 193 km². Discovered and claimed for Spain in 1499, Aruba was conquered by the Dutch in 1636. The island's economy has been dominated by three main industries: gold mining, petroleum, and tourism. Aruba seceded from the Netherlands Antilles on January 1, 1986, and became a separate, self-governing member of the Kingdom of the Netherlands. Movement toward full independence by 1996 was halted at Aruba's request in 1990. Politics of Aruba, a constituent country of the Kingdom of the Netherlands, takes place in a framework of a parliamentary representative democratic an eight-member Cabinet. The governor general is appointed for a six-year term by the monarch, and the prime minister and deputy prime minister are elected by the Staten for four-year terms. The legislature or Staten is made up of 21 members elected by direct, popular vote to serve four-year terms. Together with the European part of Netherlands and the Dutch Antilles, Aruba forms a federacy. Legal jurisdiction lies with a Gerecht in Eerste Aanleg on Aruba, a Common Court of Justice of the Netherlands Antilles and Aruba (Gemeenschappelijk Hof van Justitie voor de Nederlandse Antillen en Aruba) and the Supreme Court of Justice of the Netherlands. One of the Lesser Antilles, specifically in the Leeward Antilles island arc, Aruba is a generally flat, riverless island renowned for its white sand beaches. Most of these are located on the western and southern coasts of the island, which are relatively sheltered from fierce ocean currents. The northern and eastern coasts, lacking this protection, are considerably more battered by the sea and have been left largely untouched by humans. The interior of the island features some rolling hills, the better two of which are called Hooiberg at 165 metres (541 ft) and Mount Jamanota, which is the highest on the island, at 188 metres (617 ft) above sea level. 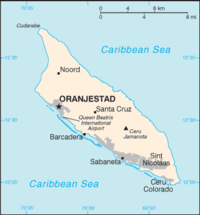 Oranjestad, the capital, is located at 12°19′N 70°1′W. As a separate member state of the Kingdom of the Netherlands, the island/state has no administrative subdivisions. On the east are Curaçao and Bonaire, two island territories which form the southwest part of the Netherlands Antilles; Aruba and these two Netherlands Antilles islands are also known as the ABC islands. The local climate is a pleasant tropical marine climate. Little seasonal temperature variation exists, which helps Aruba to attract tourists all year round. Temperatures are almost constant at about 28 °C (82 °F), moderated by constant trade winds from the Atlantic Ocean. Yearly precipitation barely reaches 500 mm (20 in), most of it falling in late autumn. Aruba enjoys one of the highest standards of living in the Caribbean region, with low poverty and unemployment rates. About half of the Aruban Gross National Product is earned through tourism or related activities. Most of the tourists are from Canada, the European Union and the United States, which is the country's largest trading partner. Before the Status Aparte (Secession from the Neth. Antilles) oil processing was the dominant industry in Aruba, despite expansion of the tourism sector. Today, the influence of the oil processing business is minimal. The size of the agriculture and manufacturing industries remains minimal. Deficit spending has been a staple in Aruba's history, and modestly high inflation has been present as well, although recent efforts at tightening monetary policy may correct this. Aruba receives some development aid from the Dutch government each year. The Aruban florin is pegged to the United States dollar with a fixed exchange rate where 1.79 florin equals 1 U.S. dollar. 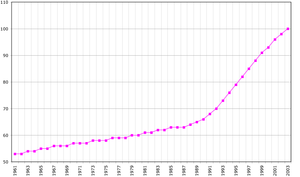 Population of Aruba, Data of FAO, year 2005 ; Number of inhabitants in thousands. Having poor soil and aridity, Aruba was saved from plantation economics and the slave trade. In 1515, the Spanish transported the entire population to Hispaniola to work in the copper mines; most were allowed to return when the mines were tapped out. The Dutch, who took control a century later, left the Arawaks to graze livestock, using the island as a source of meat for other Dutch possessions in the Caribbean. The Arawak heritage is stronger on Aruba than on most Caribbean islands. No full-blooded Aboriginals remain, but the features of the islanders clearly indicate their genetic heritage. The majority of the population is descended from Arawak, Dutch and Spanish ancestors. Recently there has been substantial immigration to the island from neighboring Latin American and Caribbean nations, attracted by the lure of well-paying jobs. The two official languages are the Dutch language and the predominant, national language Papiamento. This creole language is formed primarily from 16th century Portuguese, and several other languages. Spanish and English are also spoken. Islanders can often speak four or more languages and are mostly Roman Catholic. The origins of the population and location of the island give Aruba a mixed culture. Dutch influence can still be seen, even though not much of the population is of Dutch origin. 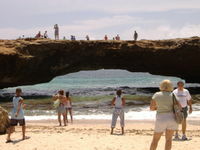 Tourism from the United States has recently also increased the visibility of American culture on the island. Queen Beatrix International Airport, located near Oranjestad, currently serves the whole island of Aruba. This airport has access to various cities across the eastern U.S., from Miami, Orlando, Houston, Atlanta, New York and Boston. It also connects Aruba with Europe through Schiphol Airport in the Netherlands. Language can be seen as an important part of island culture in Aruba. The cultural mixture has given way to a linguistic mixture known as Papiamento. However, islanders are known to speak many languages. Islanders often speak Papiamento, English, Dutch and Spanish. In recent years the government of Aruba has shown an increased interest in acknowledging the cultural and historical importance of its native language.